Fashion designer Fadwa Baruni acknowledges she is juggling with “lots of balls in the air” as she seeks a fitting theme for her Spring Summer 2016 collection. Baruni’s creations are manufactured in a Sharjah factory she does not own but subcontracts. Typically a collection has 30 to 40 “looks” and typically she designs two collections per year, Spring-Summer and Autumn Winter, in line with the fashion industry cycle. 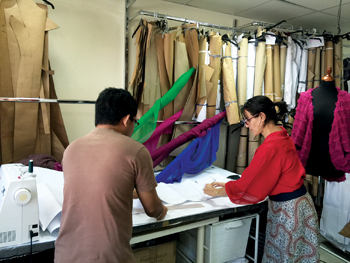 Between December 2013 and December 2014, Baruni manufactured over 2,000 garments in 50 to 60 styles. Her main markets are in Saudi Arabia, Qatar, Kuwait and of course the UAE where she’s based. “We have seen some interest from other parts of the world but our styles have over the last few years focused on regional tastes,” she says. “Our intention is to continue to build the market here in the Gulf before stepping out further afield.” Indeed, approximately 80 per cent of sales come from buyers outside the UAE. The advantage in having markets in the same, rather small, region is that “being in the same time zone or one with only an hour’s difference means they can be accessed and developed in the same way as our local market.” Baruni sells to store buyers and favours attractive elookbooks and a strong website with as much social media coverage as possible. “We are certainly working to identify and serve more export markets. We are undergoing a strategic review now and developing a plan to address this. It will require a strong combination of sales and marketing efforts,” she avers. Baruni, who was born and brought up in Libya and served in the petroleum industry with a Master’s degree in engineering from Scotland, went through a career change, selecting a new path in the fashion and garment industry. She underwent training in a fashion college in the UAE, eventually setting up Baruni Couture in 2008.